It’s easy to take a book for granted and not think about the machines and time it took to make the book, especially in the nineteenth century. The Trade Literature Collection includes catalogs for bookbinding and printing machinery. Some of those machines are shown in this 1892 Montague & Fuller trade catalog. 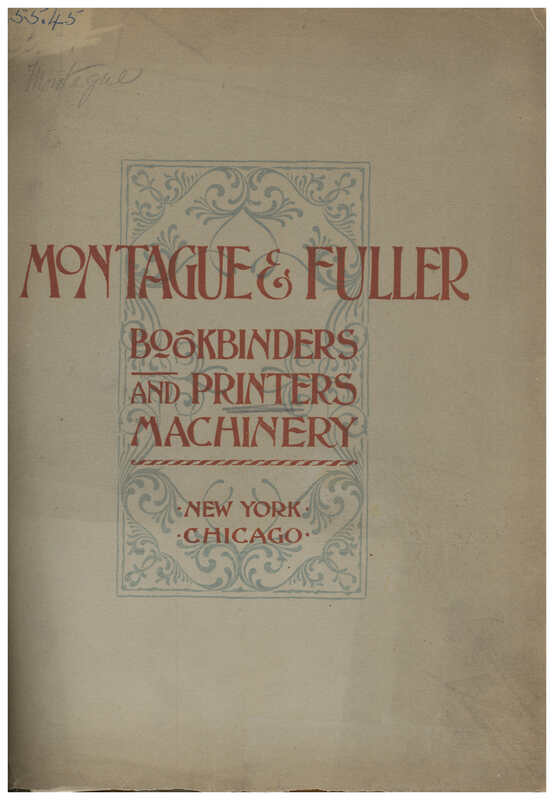 The catalog is entitled A Catalogue of the Latest Improved Bookbinders’ and Printers’ Machinery Sold by Montague and Fuller, New York and Chicago, U.S.A. Montague & Fuller were general agents in the United States and Canada for several types of bookbinders’ machines. Montague & Fuller, New York, NY. 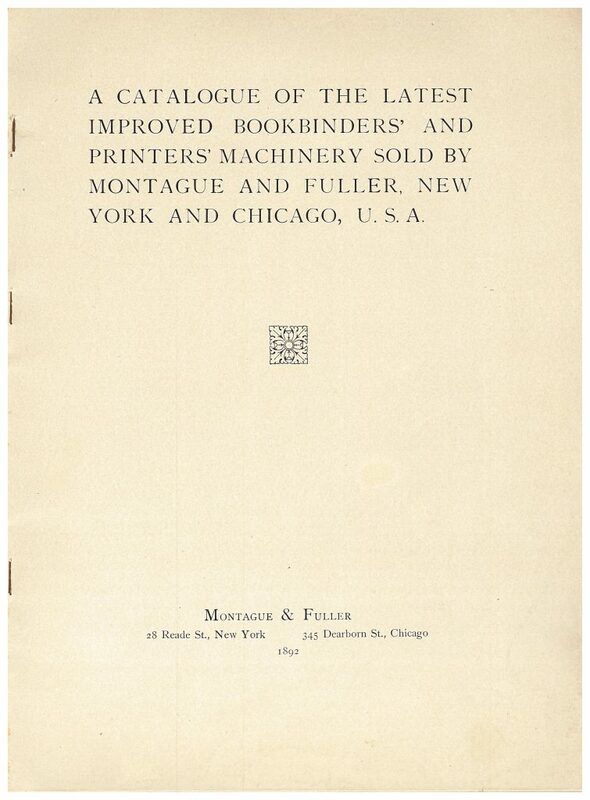 A Catalogue of the Latest Improved Bookbinders’ and Printers’ Machinery Sold by Montague and Fuller, New York and Chicago, U.S.A., 1892, front cover. Montague & Fuller, New York, NY. 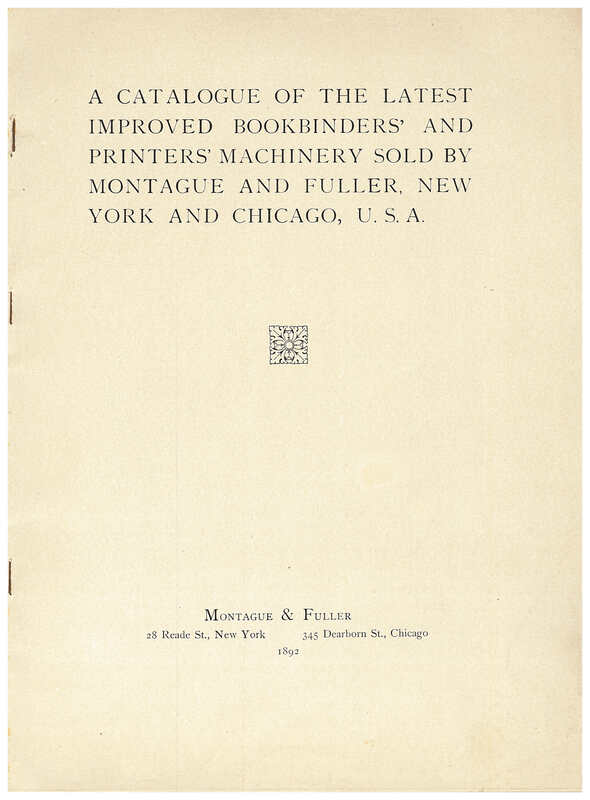 A Catalogue of the Latest Improved Bookbinders’ and Printers’ Machinery Sold by Montague and Fuller, New York and Chicago, U.S.A., 1892, title page. The Smyth Book Sewing Machines were described as labor-saving machines. 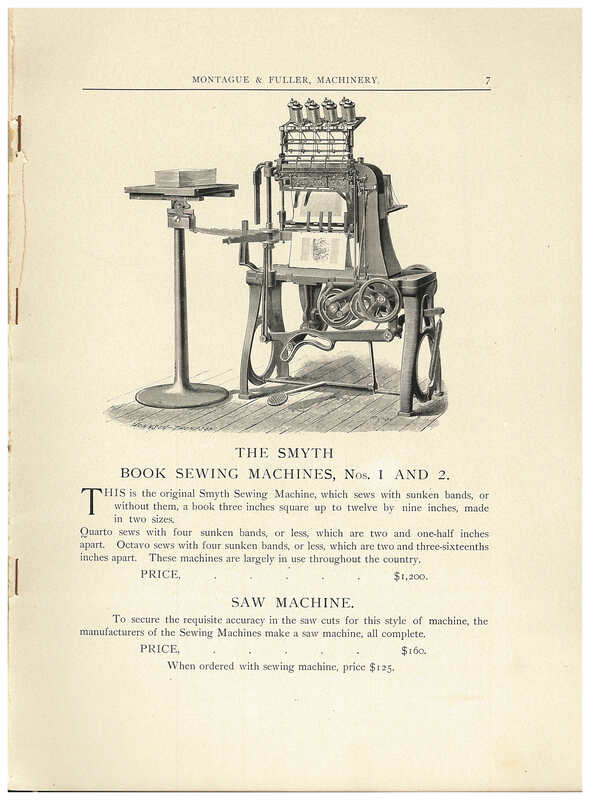 The catalog goes on to explain that the work these machines produced was “superior to hand sewing in strength and appearance.” The Smyth Book Sewing Machines averaged about 18,000 sewed signatures (page gatherings) per day, but it was possible to sew over 20,000 signatures per day. Below is an illustration of the Smyth Book Sewing Machines, Nos. 1 and 2. Montague & Fuller, New York, NY. A Catalogue of the Latest Improved Bookbinders’ and Printers’ Machinery Sold by Montague and Fuller, New York and Chicago, U.S.A., 1892, page 7, Smyth Book Sewing Machines, Nos. 1 and 2. 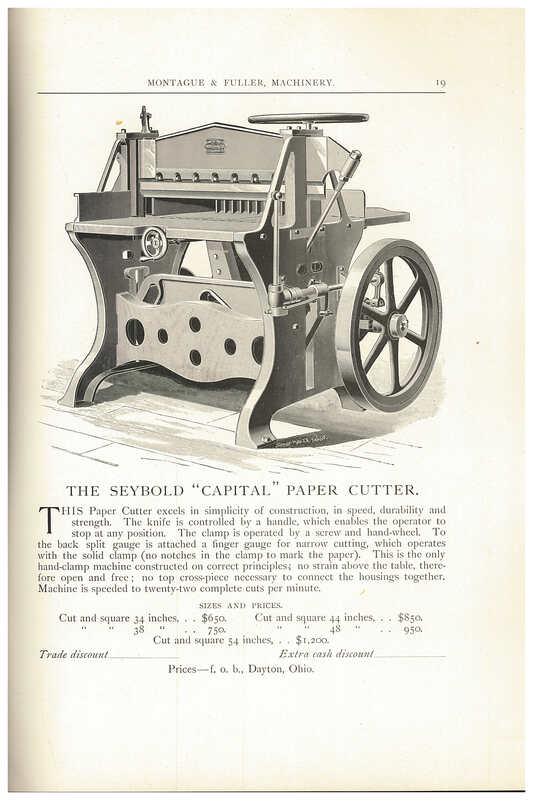 Another machine sold by Montague & Fuller was the Seybold “Capital” Paper Cutter. Because the knife in this machine was controlled by a handle, the operator had the ability to stop at any point. The machine was capable of making 22 complete cuts per minute. Montague & Fuller, New York, NY. A Catalogue of the Latest Improved Bookbinders’ and Printers’ Machinery Sold by Montague and Fuller, New York and Chicago, U.S.A., 1892, page 19, Seybold “Capital” Paper Cutter. 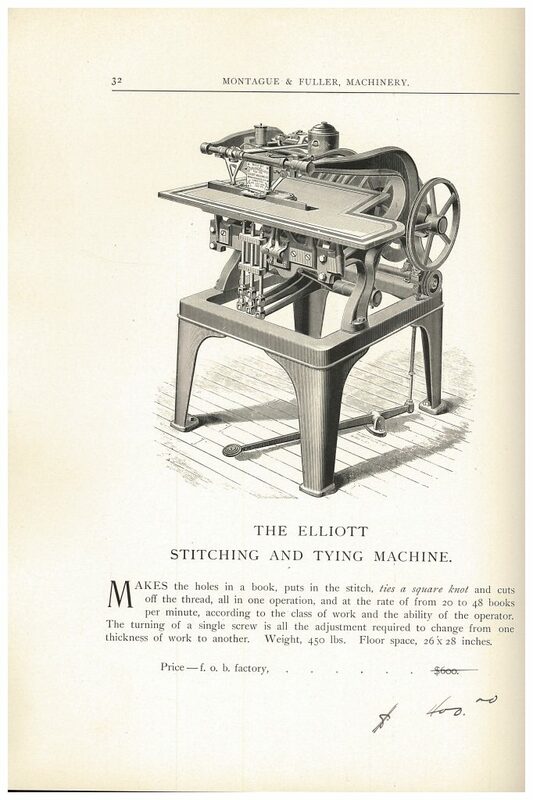 The Elliott Stitching and Tying Machine completed several steps in one operation. It had the ability to make the holes in the book, put in the stitch, tie a square knot, and cut off the thread, all in the same operation. Depending on the ability of the operator, the machine could complete that for 20 to 48 books per minute. Montague & Fuller, New York, NY. A Catalogue of the Latest Improved Bookbinders’ and Printers’ Machinery Sold by Montague and Fuller, New York and Chicago, U.S.A., 1892, page 32, Elliott Stitching and Tying Machine. This 1892 trade catalog by Montague & Fuller is located in the Trade Literature Collection at the National Museum of American History Library. Interested in other book-making machinery? Take a look at a previous post about the Dexter Book Folding Machines.